Wigan to Carr Mill Lake. Starting from Asda car park(A) on Robin Park Road, Wigan leave the car park and cyclealong Robin Park Road away from the ring road. 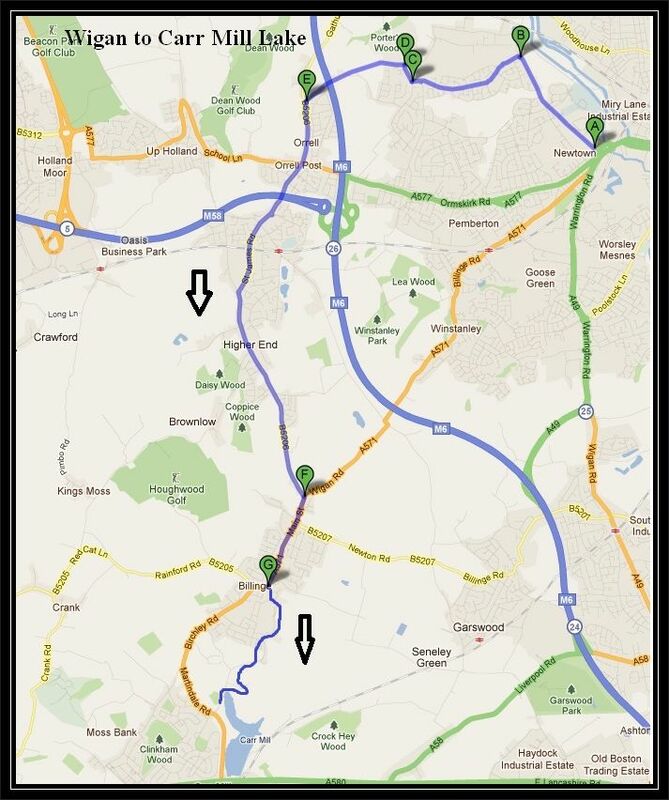 Continue along the road for 1 mile then TURN LEFT at the small roundabout along Marsh Green (B). 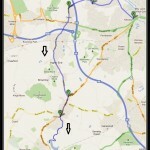 Cycle along the road to the end for three quarters of a mile where you TURN RIGHT on to Prescott Lane (C). After 100 yards at the end of the road TURN LEFT along Spring Road (D). LEFT along the B5206 (E) which takes you through the village of Orrell which was once a mining village and then you cycle under the M58 motorway and straight through the village of Higher End. After Higher End you cycle up hill and you have Billinge Hill on your right hand side also known locally as the Billinge Lump. On a clear day you can see for miles around. At the end of the B5206 (F) you TURN RIGHT on to Main Street A571 (take care at the busy junction). Continue along Main Street for three quarters of a mile in to the centre of Billinge where you TURN LEFT on to Carr Mill Road (G). Cycle along Carr Mill Road for about 1 mile where you come to Carr Mill Lake. trails and walks, as well as national competitive powerboating and angling events. Once simply a mill pond built to power Carr’s Mill, this was hugely expanded in the 1750s to provide water to The Sankey Canal. Carr Mill Dam is also the location of St. Helens only ancient woodland running alongside the railway line.